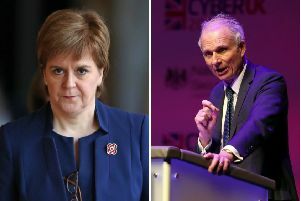 The First Minister is being urged to publish details of talks held with two Chinese firms at the centre of a multibillion-pound investment agreement with the Scottish Government. It comes after Sir Richard Heygate, the UK representative of the consortium which signed a memorandum of understanding (MoU) with Scottish ministers, claimed that three specific projects were discussed and construction was due to start within a year. This is despite Nicola Sturgeon saying this week that “there are no actual proposals on the table at this stage” as she came under pressure over the deal. Her spokeswoman repeated last night that “no specific projects” were discussed with ministers. Ministers were already facing criticism for keeping the plans “secret” after it emerged the deal was signed two weeks ago, but only came to light when published by the Chinese ­government. It also emerged that ­China Railway Group Limited (CRG), the owner of CR3 which is part of the deal, has been hit by corruption ­allegations. Sir Richard told BBC Radio Scotland yesterday that discussions have been ongoing between the SNP government and the Chinese consortium, and that construction is due to start within a year. Three projects have already been identified, he claimed. These include 5,000 homes in Falkirk, Edinburgh and East Ayrshire, as well as a biomass plant in East Ayrshire and an unspecified railway project. He added that Ms Sturgeon had been an “enthusiastic” backer of the plans. “She was just absolutely positive right from the start,” he said. These were the clean energy and housing schemes, he added. She said: “On Wednesday Nicola Sturgeon said there were no ­proposals on the table, yet the UK ­representative of the Chinese consortium has confirmed that at least three projects have been identified across the country. Nicola Sturgeon has simply not been telling the truth and that is unacceptable. Liberal Democrat leader Willie Rennie called on the Scottish Government to publish the minutes of the discussions that led to the agreement. Ms Sturgeon signed a memorandum of understanding last month with SinoFortone and China Railway No 3 Engineering Group (CR3) which could be worth up to £10 billion. A spokeswoman for Ms Sturgeon said last night: “There is no list of specific projects on the table and there is no investment agreed. “Sinofortone may have a range of high-level ideas for investment in private sector projects, as any investor would, but there are no specific projects under discussion with the Scottish Government. “In fact, we have published the memorandum of understanding, which shows quite clearly that engagement is at a very preliminary stage. “While Labour and the Lib Dems carp from the sidelines we will get on with the job of creating more and better jobs in Scotland. Asked about concerns in regards China Railway Group Limited, after the Scottish Liberal Democrats said the deal should be “torn up”, Mr Hey­gate said: “We could not be more squeaky clean in terms of backing from the very top of the Chinese state. “I have no idea what this thing refers to, but the companies we’re dealing with, you could not be more A*** in terms of backing, right up to the president of China.